Owning a 1996 300ZX means having to live with OBD-II. Although OBD-II today is a great tuning tool for newer car models, the 96′ Z was left in the dust. 1996 was the first year OBD-II was implemented in North America and it was also the last year the 300ZX was produced in North America. This left the 96 a red headed step-child when it came to easy breezy modifications like its younger kind. The 1996 year had 20 less HP, less aggressive camshafts on both the intake and exhaust for both the MT and AT alike (totally different than any of the other years). The 90-95 MT cam spec for duration is 248 on the intake and 248 on the exhaust. The AT 90-95 has a 240 intake and 248 exhaust. Drum roll for the 96………… they use a 232 intake and 240 exhaust! They also have less lift then the earlier Zs. No VTC system (Nissan’s Variable Cam Timing) also hurts power all around. The 96s also use their own special OBD-II ECUs which are tougher to tune and throw codes for non emissions friendly mods. So some have resorted to retro fit their 96s to 95 specs as far as the wiring, ECU, and cam setup goes. This maybe an easy option for some but in states like California it’s a tough option to go through with. Talk about some bad odds. Enter Alex. He has a 96 Z32 TT and has the mod bug. Alex has been our customer for almost 10 years now and he’s slowly turned the wick up throughout the years. This past December he wanted to “bump” it up some with the way of our 3″ 4-Bolt Downpipes (Stock Turbos), 3″to 2.5″ Test Pipes, Ash 2.5″ I\C Piping (w\ SZ Outlet Pipes) & Massives, Selin Dual POP, Nismo 740cc Injectors, Z1 Throttle Bodies, J-Spec Bumper, and some cooling mods for the track (auto-x & road course) duty. Freshly painted J-Spec & addition of Powertrix C.F. Ducts. Here are his results on 91 octane. We had to rely on an AFC for fuel tuning……because its a 96. Here’s where it gets interesting. Exposing the shortcomings of modifying a 96 TT. Increasing boost and fuel octane (100) did nothing for it. 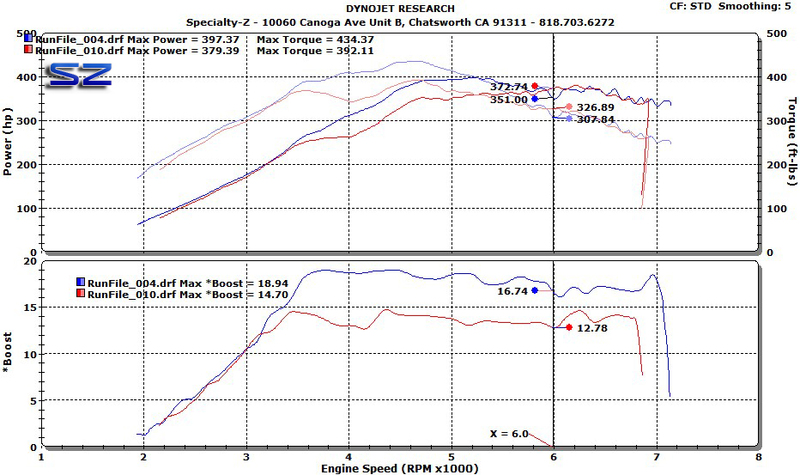 Easily seen here are the boost differences between the 91 octane tune on 14.7 psi and 100 octane on almost 19 psi. Gains are seen early on between the two only until about 5800 RPMs. After 5800 RPMs the engine cannot efficiently make use of the added boost. Running the engine at this level will only add stress to it. 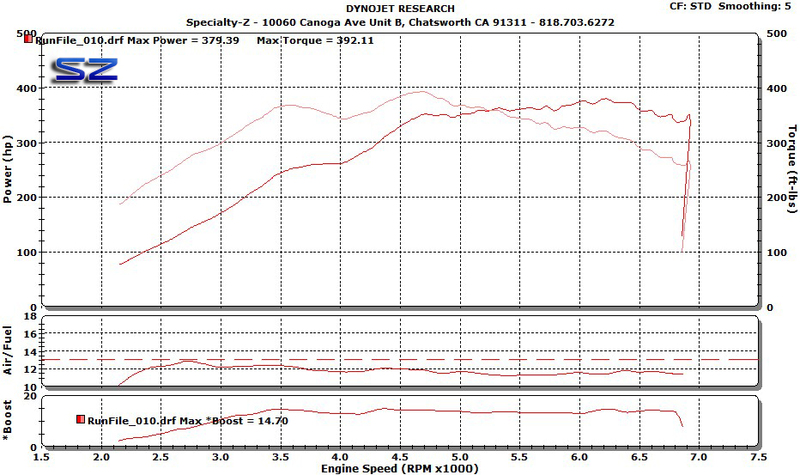 The cursor on the graph shows the differences at 6000 RPMs. Boost is 12.78 psi on 91 octane and 16.74 on 100 octane. One would expect more power but that is not the case. On 12 psi the engine is more efficient making power and torque. It makes 20 more HP & torque on less boost (12 psi). To make use of the quirky 96 and 100 octane would be to limit boost past 5800 RPMs. Up next for this 96 will be the addition of pre-96 cams while adding Nissan’s VTC system without modifying the ECU & Harness via SZ funky, fresh mods. Keeping it California legal. Great results! I am pretty much at the max for bolt on with my 96TT. I am wondering what would be the best mods to negate some of the tuning issues when I have the engine built? Would cams be the way to go with the 96? Yes, cams and addition of the VTC would be a must. Even if you did pre-96 MT cams you’d be way ahead of the 96 game. Is there a way to add the vtc with the 96ECU? Also, what is the stock timing for the 96TT?. I was told that it was lower than previous years. My local Z mechanic told me it was low at 12 and changed it to 15 BTDC. I havn’t noticed any detonation as of yet. I have JWT ECU, single pop, Z1 intercoolers, underdrive crank pulley, Mishimoto 2.5 rad. (did not know if the mods would affect safe timing?) Next upgrade will be the selin dual maf kit. What kind of gains should I expect from this? Thanks for all your help! PS, full 2.5 exhaust, no cats, divorced downpipes. Running about 1 bar. The 96s are prone to detonating more easily. We’ve seen factory “chipped” 96s ping over 12 psi and 15 degrees of total CAS timing. We’ve also seen them ping with 13-14 psi (boost jets) and JWT ECU. We had JWT change the tune for us a couple times to get it right. Check out Greg D.’s post on our blog for some expected HP gains. VTC can be added externally or done through retrofitting 95 and earlier ECUs\Wiring. If you have any other questions you can also e-mail me. Any updates? would like to see a vtc swap walkthrough. Not yet. Alex is saving up for the next round. Hey you seem to have great knowledge when it comes to the z32.I’m putting a 96 engine in a 90 hull,can I just leave the vct plugs unplugged or???? Any update on this? It’s great info on the degrees and lift. I have a 96 NA and was thinking I could just as my own solenoids and an RPM trigger to kick the VCT on and off. I believe the cams have the helicoil and spiring (inner working of the VCT) just minus the solenoids and the ECU to control them. Let me know if you know different. I have pics of my cams during my timing belt replacement and the intakes have that hat cover on the hubs. Of course now that I read there is less lift and duration it might not be worth it. Maybe just go with a pre-96 TT swap. No updates performed on Alex’s 96 TT. Regardless the cams will be changed on the 96 since they have a different profile. I have a 96 with 100k miles and my stock passenger side turbo is almost dead. Trying to decide what route to go for bigger power. Should I just get JWT cams, Bigger turbos and a Nistune type 4 dual board? hi! 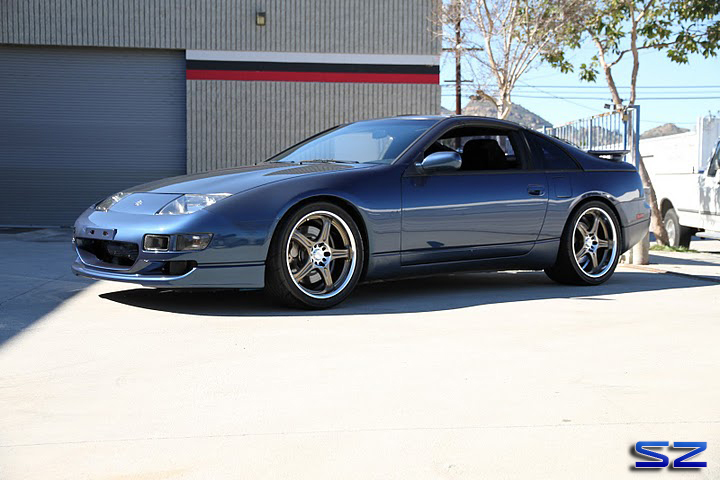 i have a doubt and i don’t know if you have solven this problem in it’s proyect o have any info available, i have a ’96 300zx TT MT, i decide swap the ecu and efi harness to a ’95 TT MT, the car is already running but i wish to keep the electronic HI-cas, do you have available some wiring diagram to connect the hi-cas to the ’95 TT ECU? can use it with the electronic hi-cas disconnected meanwhile i connect it?, or do you exist some hi-cas elimination kit for the electronic model? The ECU has nothing to do with the HICAS so the swap does NOT affect the HICAS. It will continue to work. That is one route that will dramatically help. Be sure to add VTC function when and if you go with the JWT cams. I have a 1996 300ZXTT 5-speed. I do not want to covert to OBD1. However, is it possible for me to install a stock camshaft set from an older 1995 300ZXTT 5-speed that has higher lift than my cam set ?? I do not want to install VTC. Thanks for reading and any information. Yes it is. You can do that without issue.